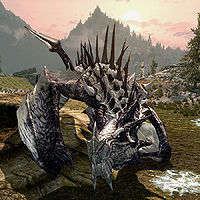 Sahloknir is a leveled dragon brought back from the grave by Alduin east of Kynesgrove. Depending on what type of dragon he is, he can breathe either fire or frost. Sah Lok Nir translates to "Phantom Sky Hunt". "I am Sahloknir! Hear my Voice and despair!" "Thurri du hin sille ko Sovngarde!" "Your Voice is strong … for a mortal." "Dohaviin [sic], your Voice is no match for mine!" "My lord Alduin requires your death. I am glad to oblige him." "My Voice has been silent for too long!" "I see that mortals have become arrogant while I slept." If spoken to, he uses the same line of dialogue as other named dragons who have yet to be resurrected from a burial mound by Alduin: "Speak, if you have aught to say worth the listening." He is unaffected by the Bend Will shout and cannot be ridden. This page was last modified on 19 November 2016, at 17:08.